With YouTube being the second most popular search engine, Facebook video ads and Facebook Live soaring as well as the innovation of SnapChat, it’s no longer a question of whether or not to create video content, but how can you create compelling video content that keeps your audience coming back for more. Digital Eye Media has some of the top videographers and animation artists who know and understand how to execute masterfully created online videos that reflect your company, brand or product. Utilizing our comprehensive research and analysis, we provide all script writing and marketing expertise in pre and post-production of the video. 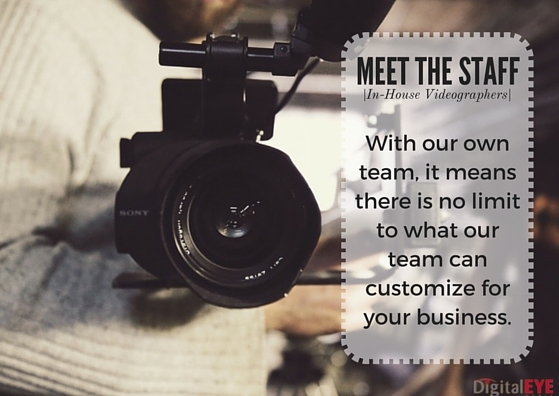 With our video project manager at the helm, we ensure timely results and continuity throughout all video’s produced. The key to effective video production is the ability to deliver a compelling message that emotionally ties your current prospects and customers to your brand. At the end of a video, we want to know that we effectively told an engaging story that our target market experiences have an emotional connection with. YouTube is the #2 Search Engine Online. So the real question is why aren’t you utilizing this engaging video platform to drive more traffic to your website? And most importantly high quality video content. As digital marketing experts, the team at Digital Eye Media has the know-how to optimize your video so that search engines can display the video at the top of the results and allow your customers to discover it. This will in turn help your page rank, increase organic traffic to your site and help build your brand credibility online. Let Digital Eye Media Create Your Promotional Video!